Yellow Trillium - Trillium luteum. Yellow Trillium is a classic spring bloomer. Its twisted yellow blossoms have a faint lemon scent. Its flowers are perched atop a trio of leaves often stippled with a paler shade of green or silver. This woodland wildflower mingles well with other spring wildflowers and ferns and is superb when massed planted in a woodland garden. It is easily grown in well-drained, humus-rich soil. This plant thrives in the shade and if left alone, will spread on its own. The Trillium goes dormant in the summer but will be one of the first flowers to return in the spring. It is commonly found in the rocky mountains and on the east coast. 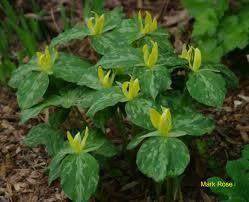 The yellow trillium loves moist, well-drained soil, rocky or clay soil. The leaves are showy and have a slight aroma to them. The plant has three erect petals of color and three petals of green. 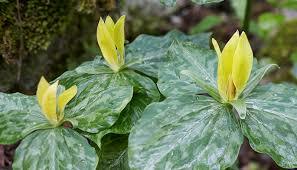 The yellow trillium can grow in the southern parts of the eastern states. This plant is an herbaceous plant that can be called a perennial, wildflower or vine. They need to be planted around 9 inches apart when they are transplanted to allow room to grow. This plant is not for human consumption. The roots need watering but do not over water. It can become both inside and outside. The Yellow Trillium produces gorgeous yellow flowers that are very showy and also have a lovely fragrance to them. This plant is in full bloom from April to May. This flower also needs to have frequent watering; it thrives in soils that stay moist, but not too wet. Along with the gorgeous yellow flower that blooms the stem and leaves are rather impressive as well, they are different light shades of green spotted purple.